HDFC Equity Fund needs no introduction— it's popular with a performance track record spanning more than two decades. 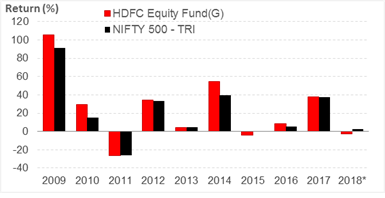 However, despite being one of the largest equity funds in India, HDFC Equity Fund is fast losing its charm after a substantial slowdown in performance over the last few years. An investment of Rs 10,000 in HDFC Equity Fund 5 years back, would now have appreciated to Rs 26,031. A simultaneous investment of Rs 10,000 in the benchmark Nifty 500 – TRI index would have grown to Rs 23,334. With a CAGR of around 21%, HDFC Equity Fund has outperformed the benchmark by about 2.5 percentage points over its benchmark (18.5% CAGR). However, the margin of outperformance is not very significant, compared to peers that have beaten the index by over 5 percentage points over the same time period. Being in existence for over two decades, HDFC Equity Fund holds a superior long term track record. Over the last 5 years, the fund has been seen lagging the benchmark and category peers in a down trending and markets, but has managed to sail past its peers during follow up recoveries and market rallies. 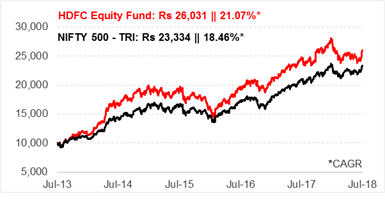 The year-on-year performance comparison of the fund vis-à-vis Nifty 500 - TRI shows that the fund has fallen short of the benchmark in 4 out of the last 10 calendar years, especially when the markets were under pressure. The bouts of underperformance shown by the fund is another concern among its investors. Major Losers: On the other hand, KSK Energy Ventures, Gammon Infrastructure, Hindustan Construction Co., Siti Networks, BEML, Oriental Bank Of Commerce and Punjab National Bank, are among the stocks present in the fund’s portfolio, that lost over 40% in value. 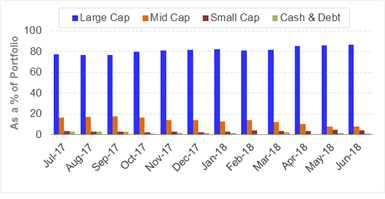 Multi cap funds provide the benefit of diversification across market caps. In the absence of any limit on market cap segment, HDFC Equity Fund may not carry equal weightage to each market cap segment. It is expected to operate more like a pre-dominant large cap fund. 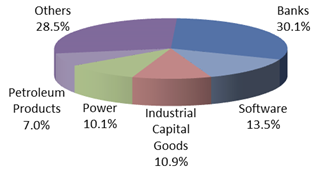 While its focus towards large cap stocks may help during turbulent market conditions, its concentrated bets into few selected stocks and sectors could lead to additional volatility and lower returns if the stocks don’t perform as per the fund manager’s expectations or if any of the underlying themes remain out of favour. The fund has shown tendency to underperform its peers as well as the benchmark during extreme market conditions. If you a long term investor looking for a solid wealth-building portfolio for the next 7-8 years, we might have a perfect solution for you. It is based on a time-tested investment strategy favored by most of successful investors to create wealth consistently over years. We call it the ‘Core + Satellite’ strategy. 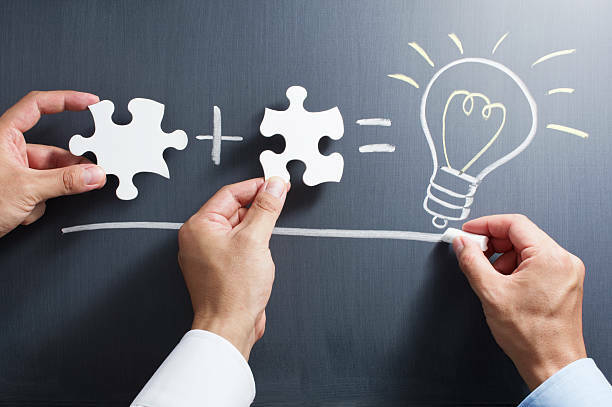 In this strategy, a part of the portfolio is invested for long term which stays unchanged, while another part is timely optimized to boost the portfolio returns. If you are wondering how to go about employing this strategy, don’t worry. We already have one ready for you. Click here to know more.